With its red brick buildings, Georgian architecture, striking vistas and expansive green spaces and trees on its 450-acre campus, Bucknell offers beautiful facilities, outstanding services and an attractive location for Pennslyvania conferences, camps, weddings, and events. 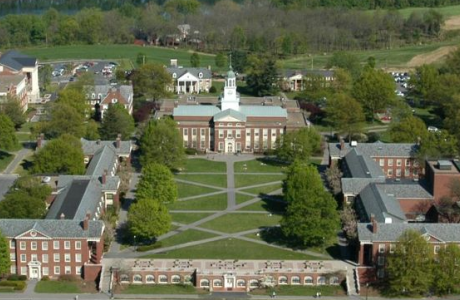 Bucknell offers more than 100 facilities, including a performing arts center, art gallery, chapel, expansive athletic fields, and state-of-the-art fitness center. Our Lewisburg, Pennsylvania venues boast onsite Gold Standard catering, intuitive audio visual technology and support which can be designed to best meet the needs of your event. We also offer camp and conference housing in our air conditioned residential halls and apartments. A short walk to shopping and restaurants in downtown Lewisburg, outdoor enthusiasts love the abundance of fishing, hiking, cycling, and kayaking available in our area. For more information, please visit our website to learn why Bucknell University is the ideal Lewisburg, Pennsylvania meeting and event venue. Kinney Natatorium	 Kinney Natatorium houses the swimming and diving and men's and women's water polo programs for Bucknell. The multi-purpose facility is a state-of-the-art venue that features a 50-meter by 25-yard Olympic class pool. It seats 500 spectators. Gerhard Field House	 Features a six-lane, 200-meter indoor track, including eight lanes on the straightaways, racquetball courts, squash courts, climbing wall, in-door tennis and basketball courts. Sojka Pavilion	 4,000 seat Sojka Pavilion is the home of the Bucknell men's and women's basketball teams. Christy Mathewson Memorial Stadium	 Seats about 13,000 people and includes an eight-lane, all-weather track and grass-like artificial playing field for football and lacrosse. Terrace Room	 This multi-purpose room is great for lectures, luncheons, and receptions. Varsity Tennis Courts	 Located behind Gerhard Fieldhouse, the varsity tennis courts are the competition venue for the Bison men's and women's tennis teams. Tower of Samson	 Bucknell Challenge Course at Cowan Forrest Brown Conference Center. Bucknell Hall	 Concerts, recitals, and lectures have been given here. With an 18'x60" stage and seating for 132 people, your venue will display a formal and professional ambiance. The stage consist of a piano, 6 wooden chairs with an additional 12 folding chairs. It is equipped with a wireless microphone. Rooke Chapel	 It has the availability to comfortably seat 730 people. The chancel accommodates a Baby Grand Piano. Depew Field	 Located across Route 15 from the main Bucknell University campus at the West Fields complex. Bucknell Club House	 The Bucknell Golf Club is a semi-private golf club, as well as the home course for the Bucknell men's and women's golf teams. The Golf Course is ranked as one of the top 7 college golf courses on the east coast, and has hosted multiple US Open Qualifiers over the past 15 years. Emmitt Soccer Field at Holmes Stadium	 This state-of-the art, natural-grass playing surface provides Bucknell’s soccer student-athletes one of the premier venues in the nation to call home. The stadium includes covered chairback seating for more than 1,000 spectators, indoor viewing suites and press box. Hildreth-Mirza Humanities Center - Great Room	 The student-centered amenities include five conference rooms, a kitchen that's available to small classes that incorporate food studies, a cozy library, a humanities lab with large monitors, screen-sharing technology and laptops to loan, and outdoor patios and porches on the first and second floors. Events Management	 The Events Management office actively promotes the use of University venues to outside groups and organizations, providing high quality conferencing services, utilizing Bucknell's facilities and service departments efficiently and to the greatest extent possible. Our staff offers expertise in planning, coordinating, and managing your meetings to ensure success!